Cows walking out in the snow. I was driving around and I saw these cows just turned out from the barn. They ran down the fence line to the tree on the left stopped in this couple of them started walking back. They seemed quite playful and to be enjoying themselves, happy to be out of the barn. 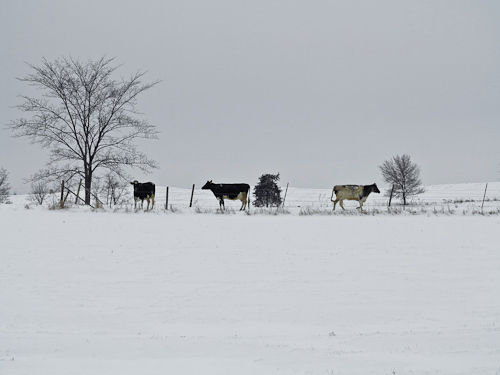 This entry was posted in Uncategorized and tagged copyright ryan ware, cows, fence, snow. Bookmark the permalink. “Driving around” often seems to yield the most surprising and delightful images, doesn’t it? Another wonderful snippet of rural life, Ryan. One of my favorite things to do is to point the car in a general direction and see what catches my eye.